Beats & Bars pays homage to its hometown with a Wolverhampton Hip-Hop special. After putting on Hip-Hop events on now for over a year we thought it would only be right to put an event on that featured some of the cities leading Hip-Hop acts & DJ’s. 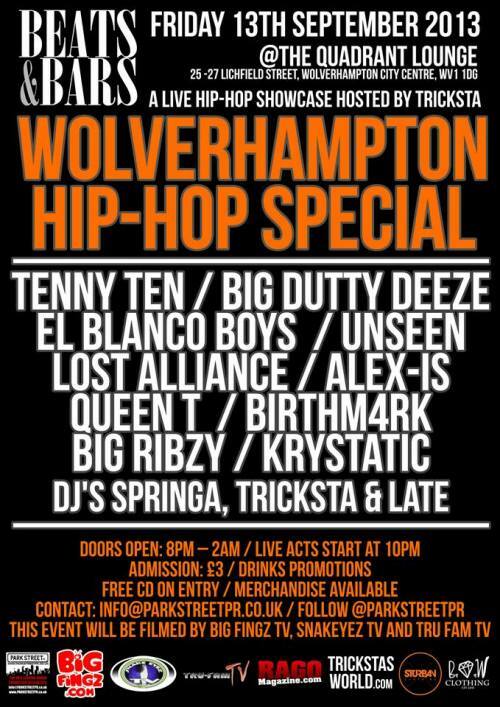 Wolverhampton City, it’s time to stand up, represent and support local talent. With ten acts and three deejay’s this event promises to be history in the making! This event will be filmed by Big Fingz TV, Snakeyez TV and Tru Fam TV.